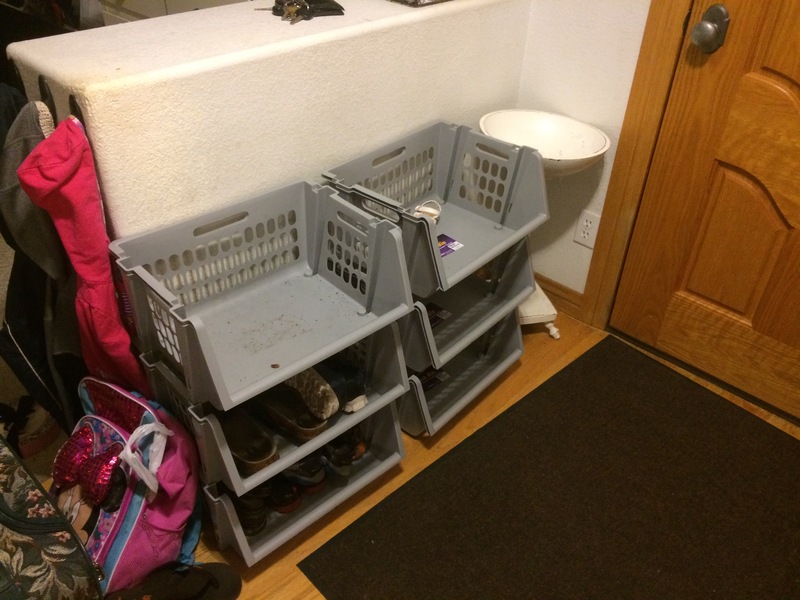 Those are bins to hold shoes; they’re uncharacteristically empty in this picture, but with as many as seven kids in the house at any given time, they’re usually overflowing (and not nice to look at). but it wouldn’t be quite big enough, and it wouldn’t make productive use out of all of the space by the door. 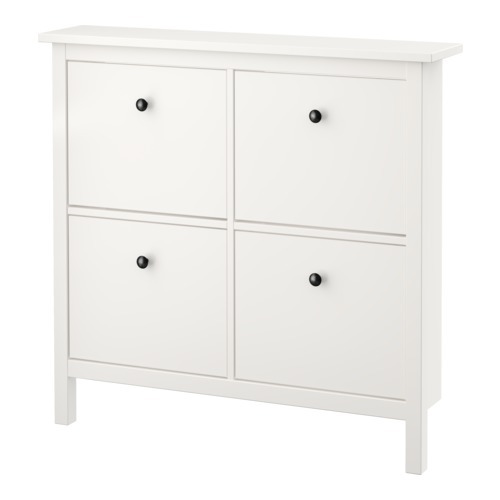 I decided instead to build my own custom version of HEMNES. 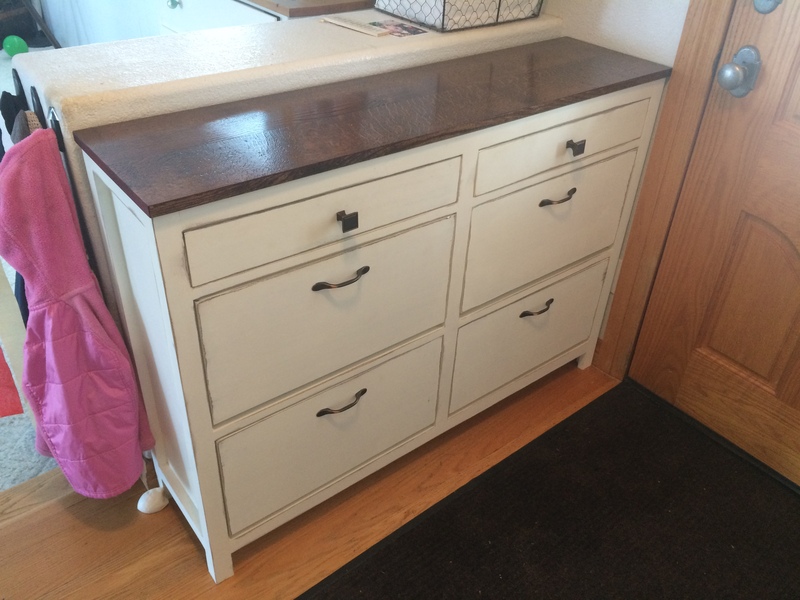 The top two compartments are drawers, and the bottom four are tilt-out cabinets. 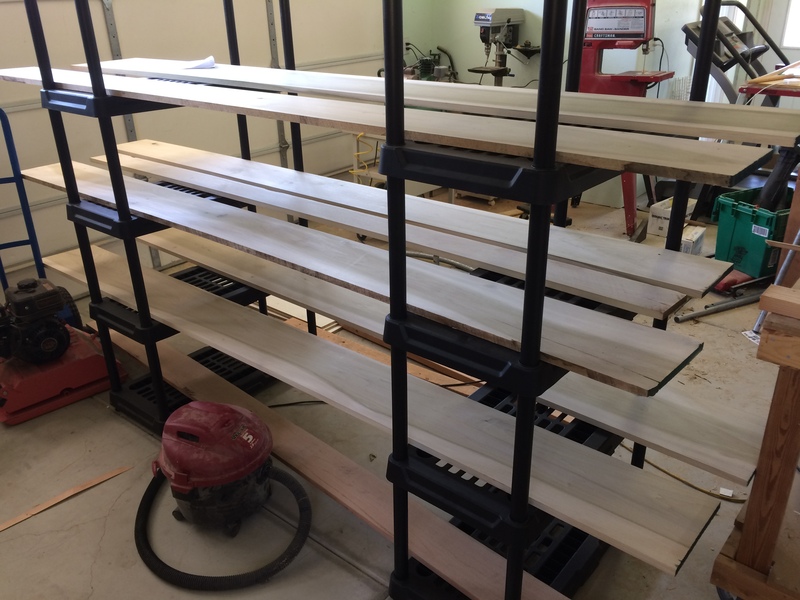 I bought S3S poplar from the local hardwood retailer and some red oak for the top. I chose poplar because the base would be painted, and it has worked well in other similar projects. 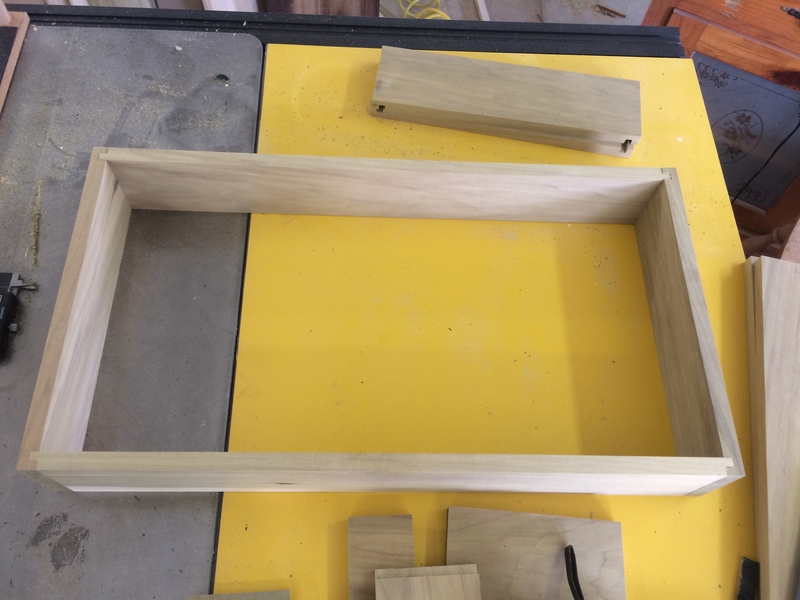 I built a basic box by connecting the sides with some 1x5s on the back and more 1x2s on the front. My original plans only had a single 1×2 running down the center, but I decided to double it up, and I’m glad I did. 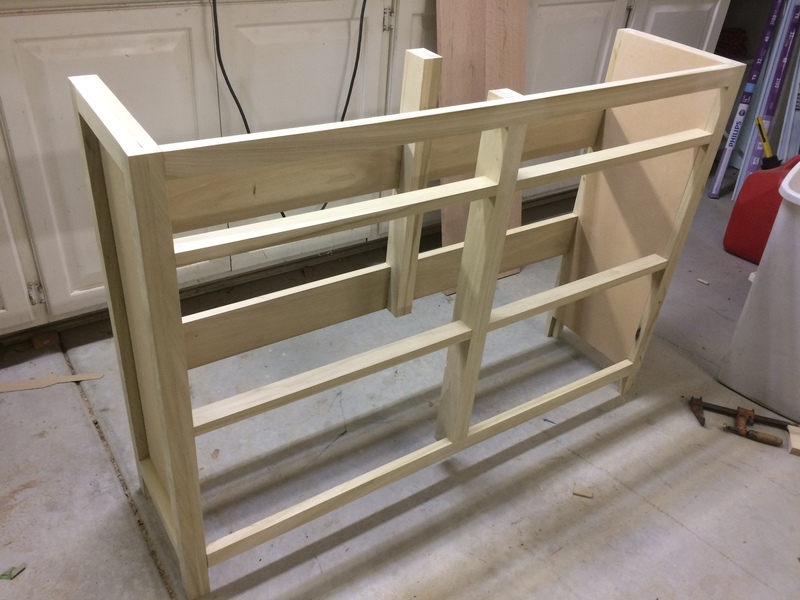 I used pocket holes to add the dividers between the rest of the drawers and cabinets. 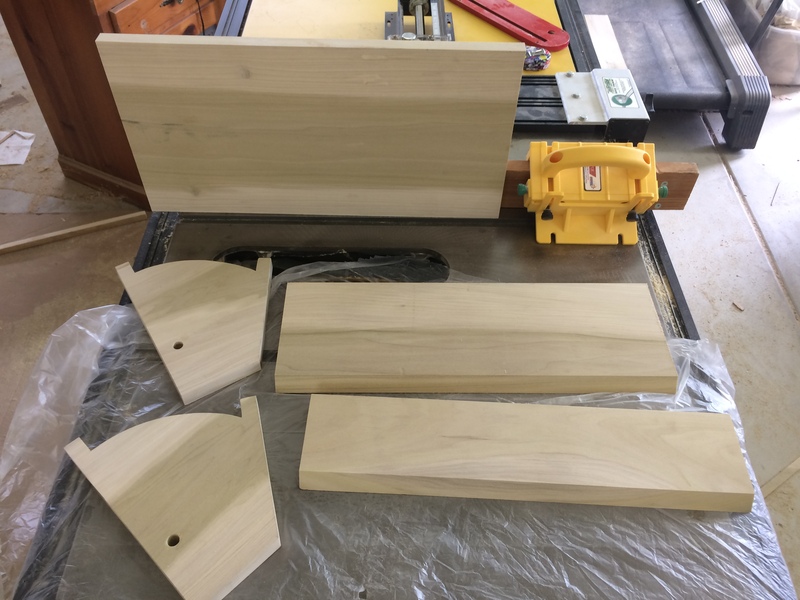 I took my time and cut each cabinet face to fit its opening instead of cutting them all in identical sizes based on the plans like I used to do. 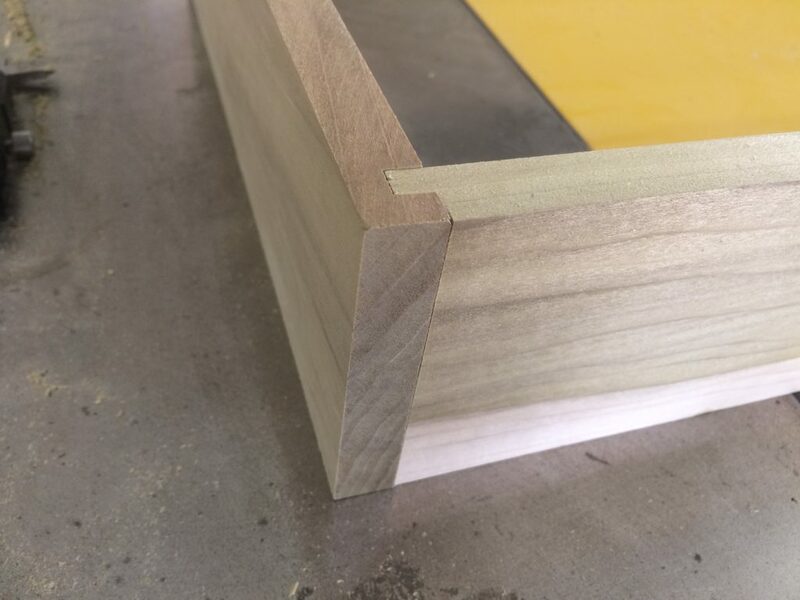 Taking this extra time ensured that every face fit perfectly, since nobody’s perfect, and the openings deviated by about 1/8″. 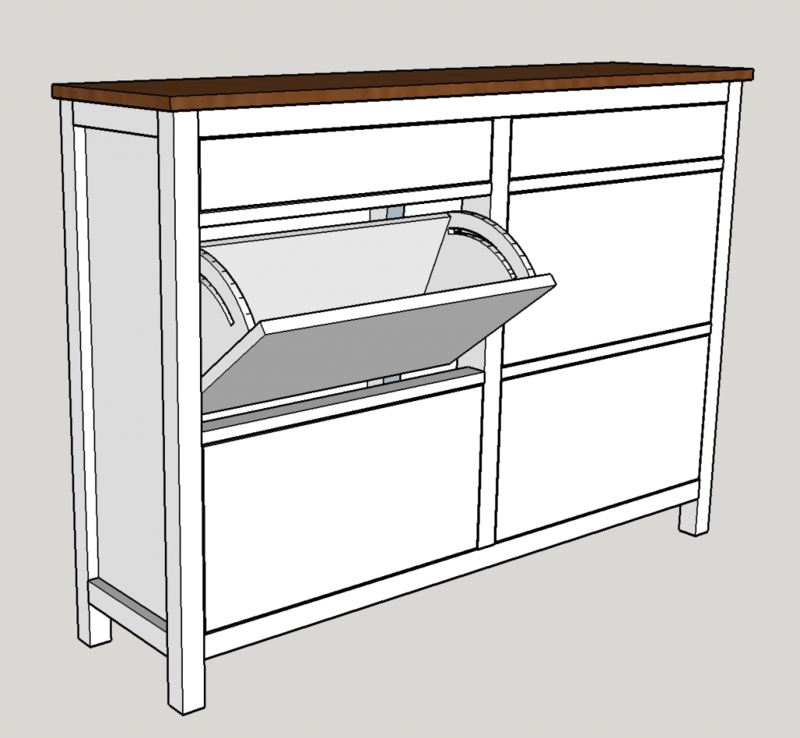 The tilt-out cabinets are composed of five pieces. The side pieces are cut in such a way that a single stop-block will set the closed and open positions, and a dowel on each side will act as the hinge. 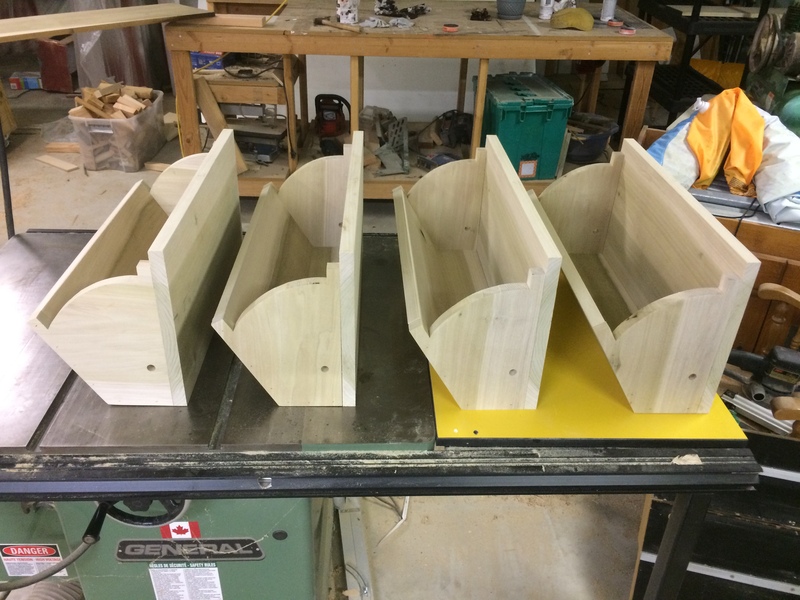 I initially planned on CNC’ing the sides, but I changed my mind and decided to get some practice on the bandsaw. Looking back, I wish that I had planed these down to at most a half-inch thick; the bins are really bulky. 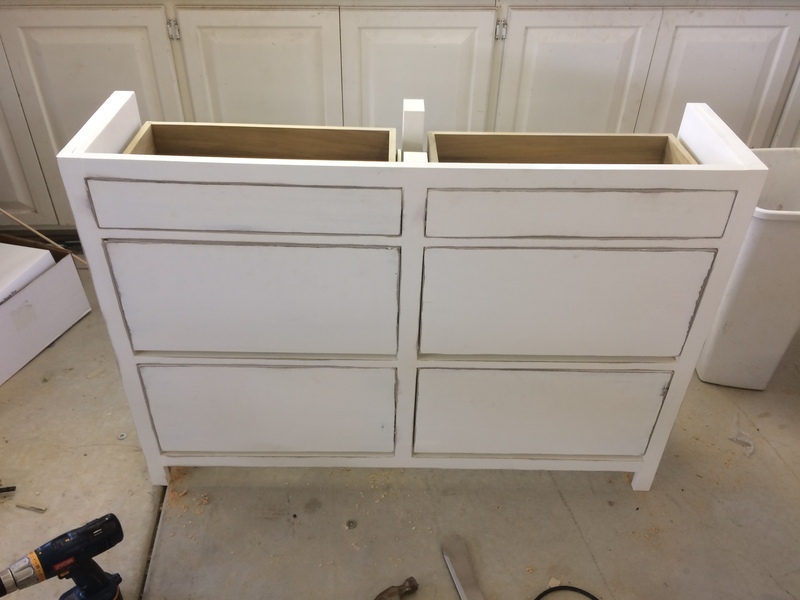 I put some stain on all of the edges and small faces in preparation for painting over them and then weathering the paint to let the stain show through. My wife likes this kind of finish, and that’s fine with me, because it hides (some of) my mistakes. 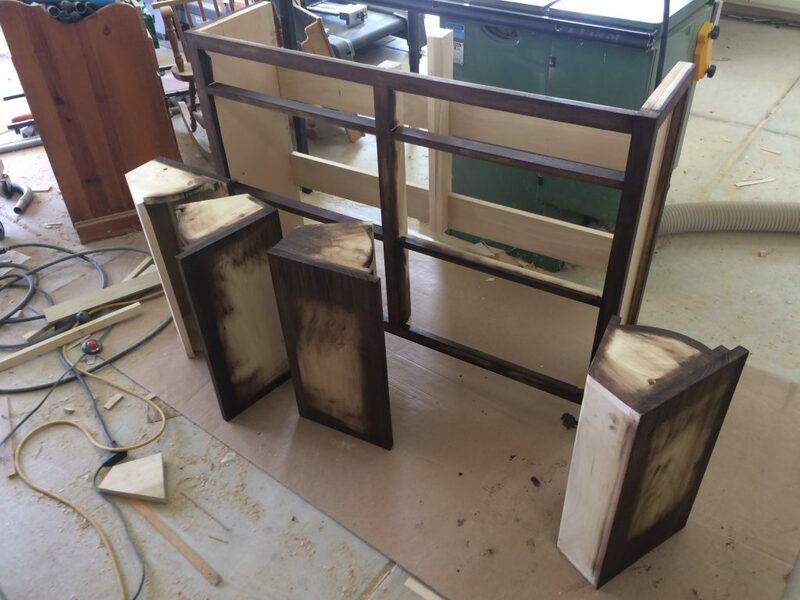 I joined two pieces of red oak and then stained and sealed them for the top. 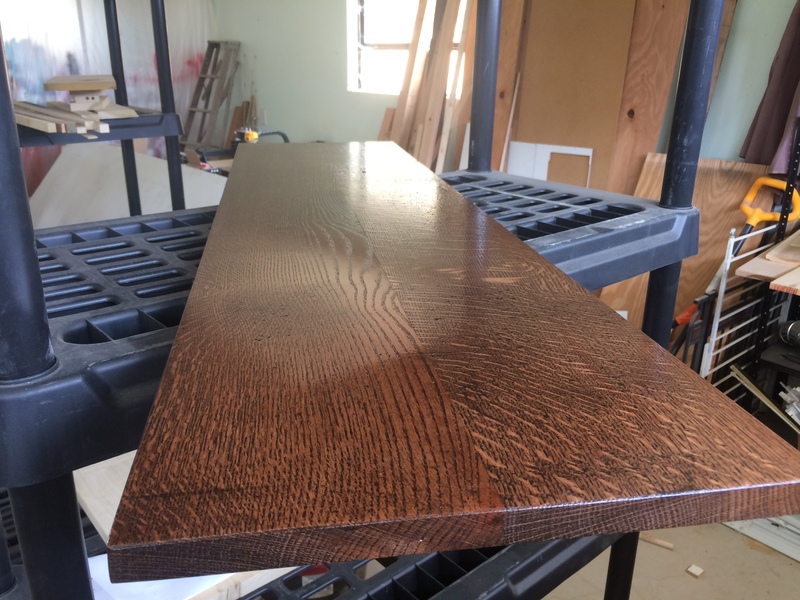 I used Varethane’s Kona stain. 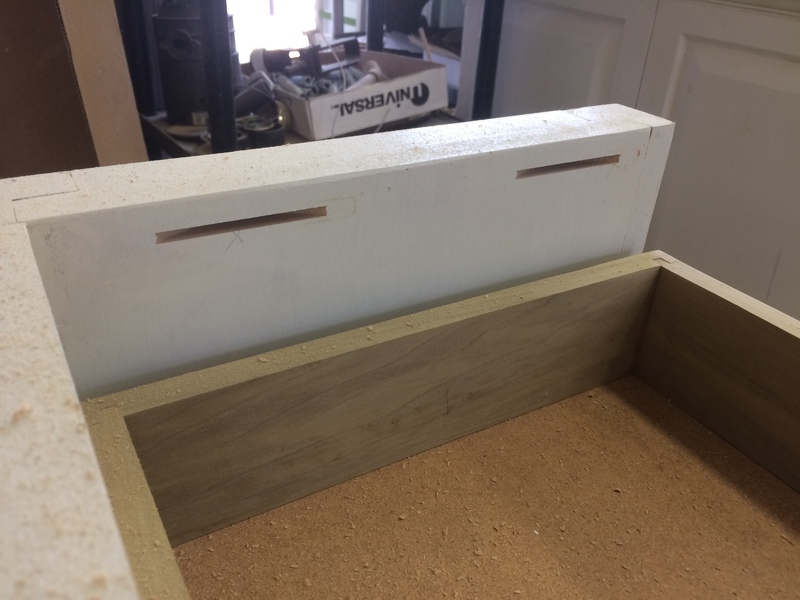 The drawer boxes were constructed with lock rabbets using WOOD Magazine’s drawer method. 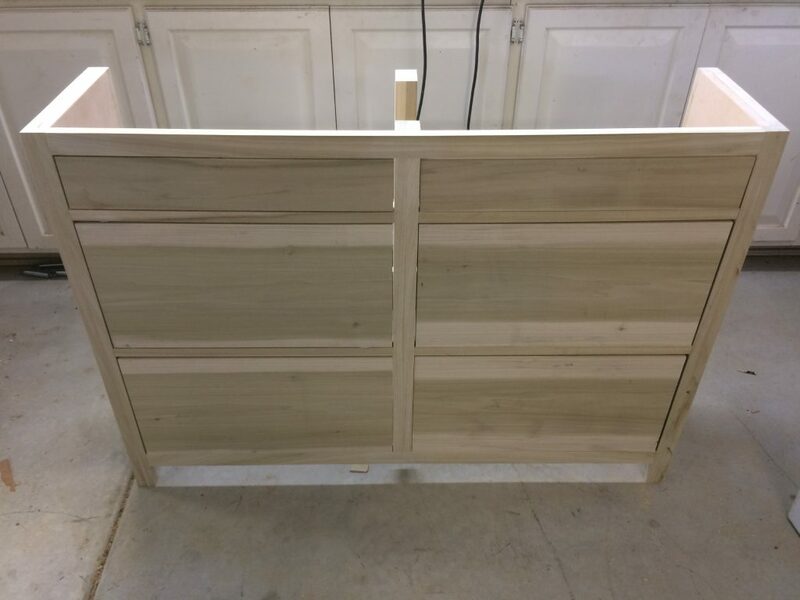 I was really happy with how this worked out, and I was able to do it all with my regular table saw blade (and some time). 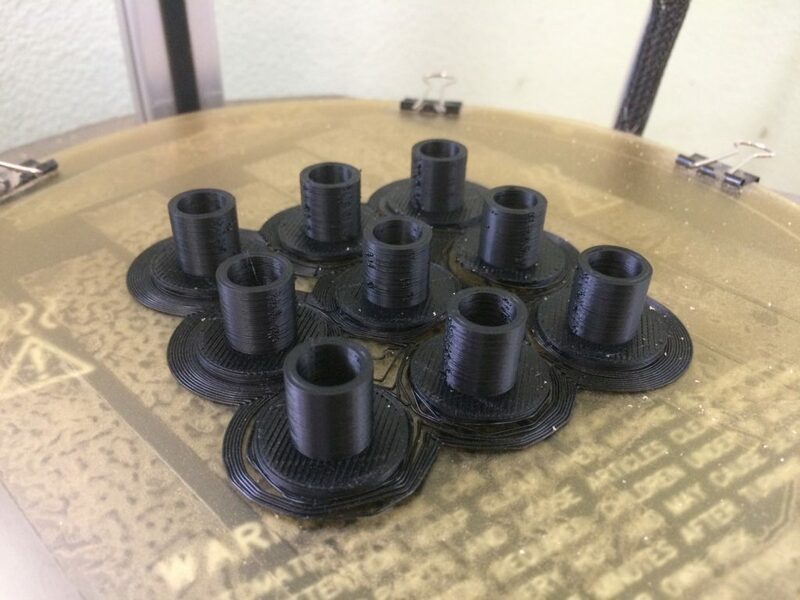 For the cabinet hinges, I printed plastic collars to fit around the dowels so that there wouldn’t be wood rubbing against wood, hopefully reducing wear-and-tear. 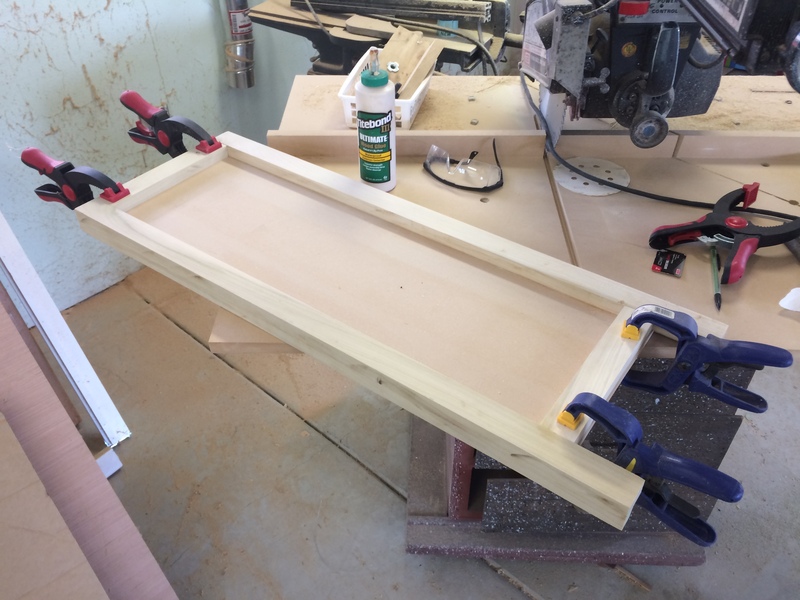 You can see the collars here, as well as the dowels I used as stop-blocks at the top. 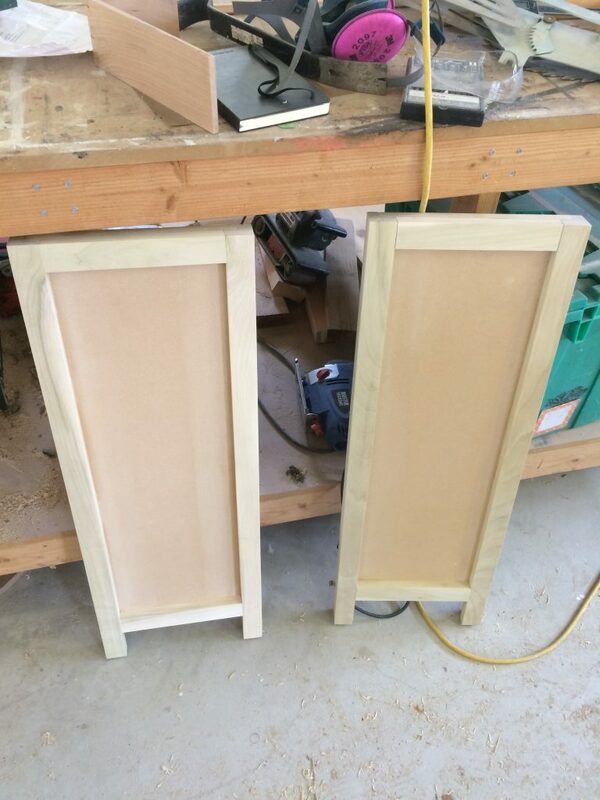 Those dowels stop the cabinet from closing farther than flush and opening so far that they’d spill their contents. 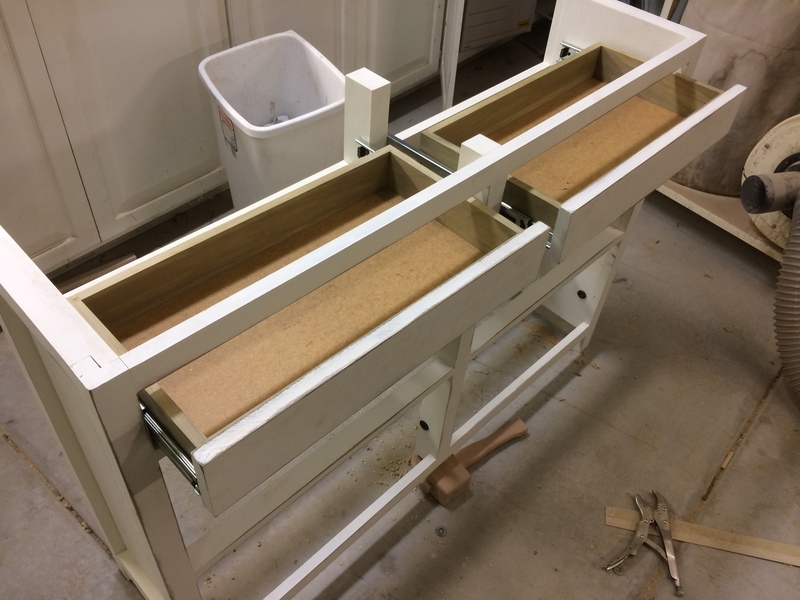 The drawers went in next with full extension slides. 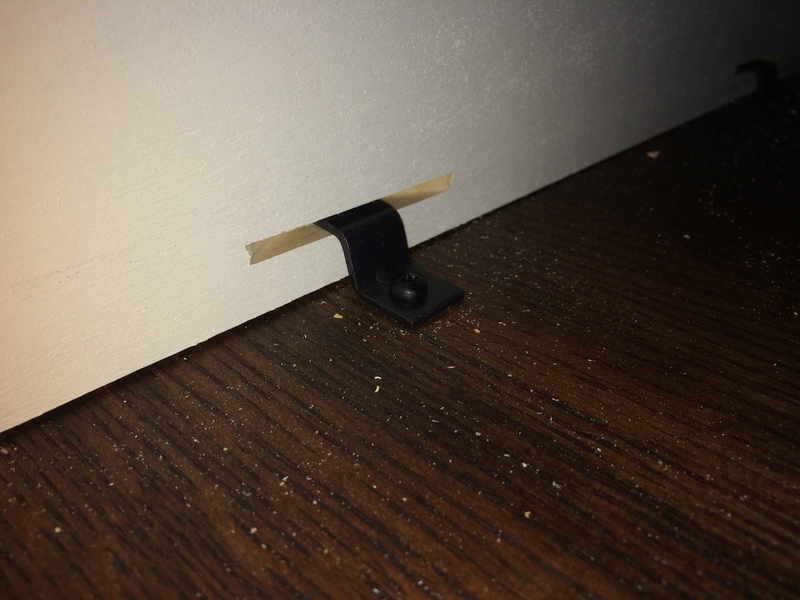 I used a biscuit joiner to cut two slots in each end to receive the tabletop clips that are screwed to the underside of the top. 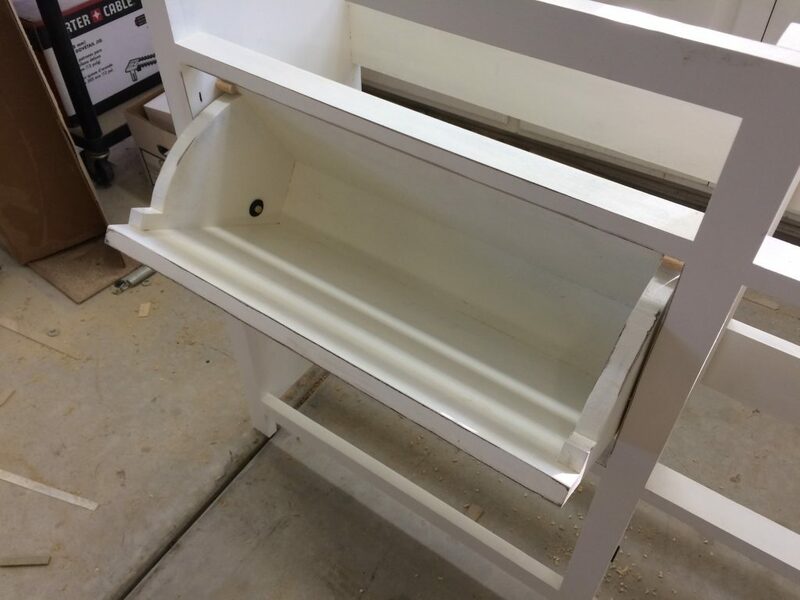 I don’t have a picture of this finished assembly, but it would look the same as this one from when I built our kitchen table. 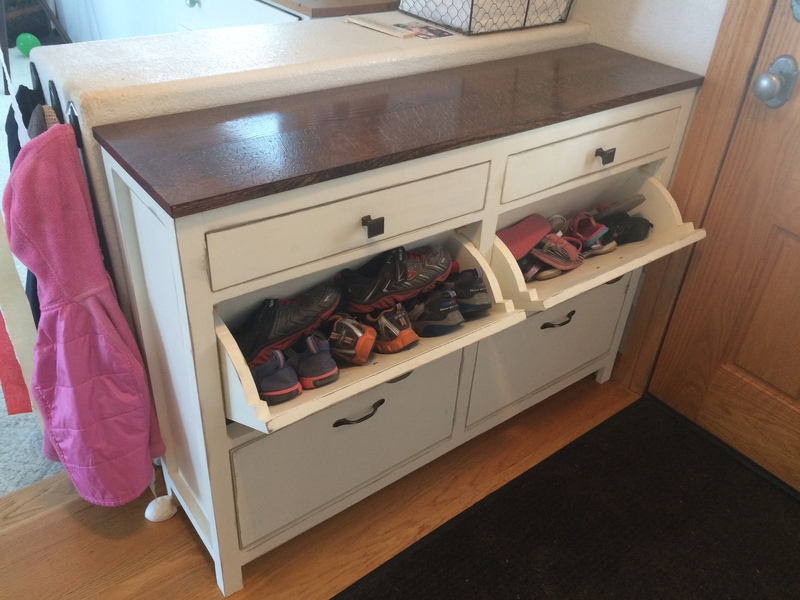 Alternate title for this blog post: Shoe Cabinet, Don’t Bother Me.